Author hits a home run with this one! This story kept me riveted the whole way. 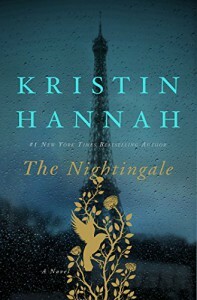 And unlike another of Kristin Hannah's books - (I won't name it because I'm sure it's a favorite of many) that I read and liked right until the last chapter because it seemed rushed, forced, and too tidy, - this book had a very satisfactory ending for me. I learned some things, as well, about WWII that I don't think we tend to remember and that we should never forget. Wow, I'm rambling... sorry. I just finished this so it's all very fresh in my head and heart, and I would recommend it highly as perhaps this author's best book yet.